Ever since I got engaged in November I have been trying my best to eat less carbs...I mean have you ever tried on wedding dresses? Most of the designer gowns come off the runway and go right to the Trunk Shows, so yea were talking size 2 and less. Needless to say the less bloat the better. Although I am trying to eat healthier I still want to enjoy my meals especially after a long work day. This dish is truly crave-able because it has one of the most craved ingredients in it, Peanut Butter. The peanut butter gives it the creamiest most delicious texture, the soy sauce gives it the perfect umami salty bite and the lime and cilantro both cut through the richness with their fresh flavor. 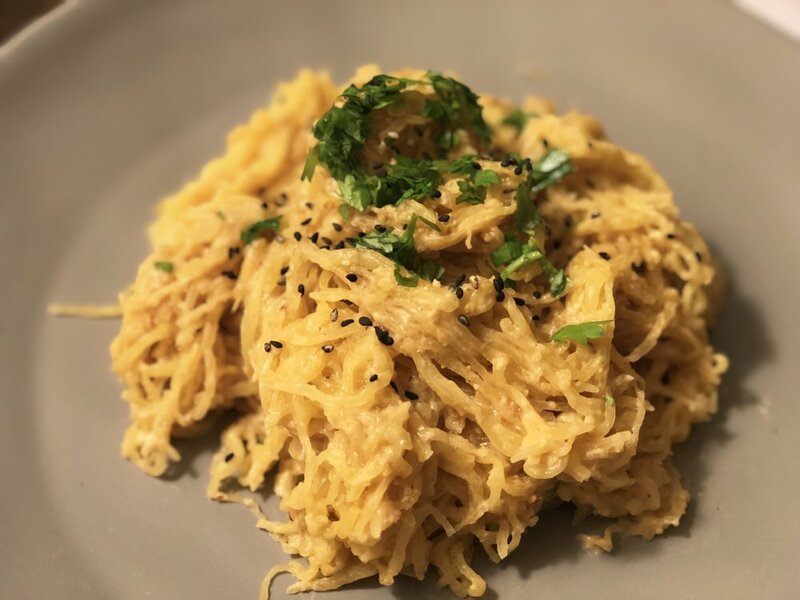 Peanut Butter noodles in an Asian Restaurant can really pack a punch in the carb/calorie department but swapping the pasta out for Spaghetti Squash makes this almost guilt free. And hey it is Vegan and Gluten Free (if you use GF soy sauce)! Cut the Spaghetti Squash lengthwise and brush the inner flesh with Olive Oil and Season with Salt, Black Pepper and a squeeze of fresh Lime juice. Roast on a parchment lined sheet pan cut side down.Roast for roughly 45 minutes or until you can easily puncture the outside skin with a fork. While the squash is roasting make the sauce. When the squash is done, scrape the inside of the squash into strands with a fork, it will resemble spaghetti. Leave it a little al dente so it has a slight bite like pasta. In a food processor or bullet blender, puree the peanut butter, soy sauce, rice vinegar, lime juice water, grated ginger, garlic clove, Sesame oil, and red pepper flakes. In a large pan or pot on low heat toss the cooked spaghetti squash with the sauce until the sauce is fully incorporated. Plate and season with salt and pepper as needed but the soy is salty so you may not need it. Squeeze Fresh lime juice over the top and top with fresh chopped Cilantro and Black Sesame Seeds or Chopped Peanuts. Serve and enjoy! A few months ago my little sister made every Italian mother's nightmare come true...she became a vegan! In the words of one of my favorite movies My Big Fat Greek Wedding, "What do you mean you don't eat no meat!?" Needless to say we all gave her a hard time. I mean whats a life without cheese, without that perfect runny egg yolk, without BUTTER!? We all thought it was a phase but hey this girl has been sticking to her guns! Since I love my sister oh so much I decided to surprise her with a special vegan dessert for her 20th birthday. Like the rest of the Marullo clan, Julia loves chocolate and her favorite dessert was always the Double Chocolate layer cake from Magnolia Bakery in NYC. 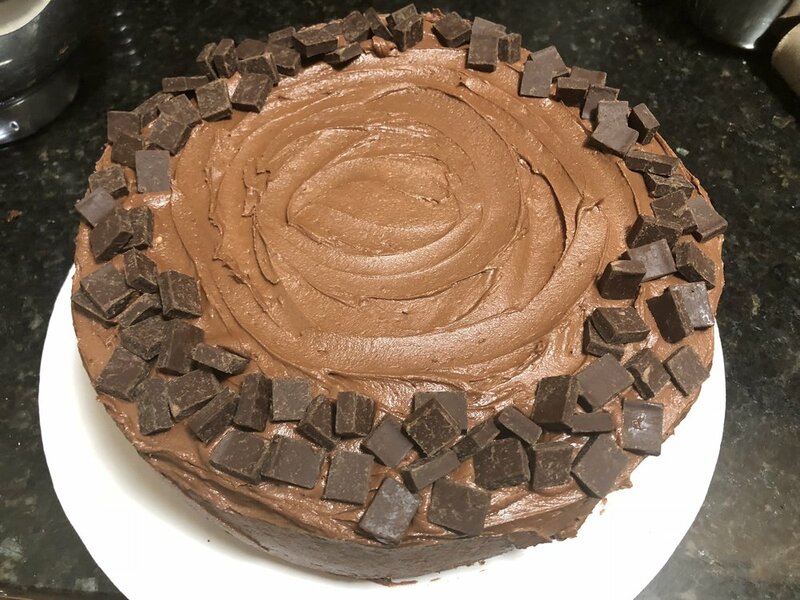 After some research and the combining of a few good looking recipes I came up with the following recipe and let me tell you it is decadent, it is chocolatey, it is moist and you will not miss the dairy one bit! It tastes a lot like the Magnolia Bakery Cake but its vegan! To Make the Cake: Preheat your oven to 350F. Prepare two 8" round baking pans by lightly greasing them, and then cutting a circle of parchment paper to fit into the bottom. You can also use a 9 inch spring form pan and then careful cut the baked cake in half horizontally to fill it with icing but it will take more time to bake. This recipe will also work in sheet pans and cupcake tins! In a large bowl whisk together all of the dry ingredients, then set aside. In a medium bowl whisk together all of the wet ingredients. Pour the wet ingredients into the dry ingredients and mix until just combined. Don't over mix. Divide the batter into the prepared pans, then place them in the oven. Bake for about 40 minutes until a toothpick inserted into the center comes out clean. Let the cakes cool completely before frosting. Vegan Buttercream Frosting: Use a mixer with a paddle attachment or a hand blender and whip the vegan butter and shortening until light and fluffy. Add all the rest of the ingredients except for the Almond Milk. Blend until whipped and creamy. If the frosting is a bit too stiff, add 1 to 2 tablespoons of Almond milk as needed until desired consistency is reached. Assemble the Cake: Run a knife around the edges of the cake pans, and flip the pans over to remove the cakes. Remove the parchment paper and discard. Place the first cake on your cake plate, and spread about half of the frosting on top. Place the second cake on top of the frosted cake, and spread the remaining frosting on top of that cake. Add sprinkles or Dairy Free Chocolate Chips around the perimeter to add a little pizzaz! Store the cake in the fridge or a cool place until you are ready to serve. Serve at room temp! Try this easy, healthy and hearty meal full of bold flavors! Heat coconut oil in a pot, preferably a ceramic, dutch oven style pot. In a small bowl mix together the Turmeric, Chili Powder, Coriander, Cayenne, a dash of freshly ground black pepper and a 1/2 teaspoon salt. In a medium bowl, toss the chicken cubes in half of the spice mixture. Add the chicken to the hot pot with the coconut oil and cook until brown on all sides but not fully cooked. Remove from the pot and set aside. Right away add the sliced onions, bell pepper and bay leaves and sweat them until they begin to soften. Add the garlic and ginger and stir until fragrant. Add the chicken back to the pot and sprinkle in the remaining spice mixture. Cook for a few minutes to get the spices to bloom. Now add the tomato puree (or diced tomato) and cook for 2-3 minutes. Add the coconut milk and chickpeas. If there isn't enough liquid add about 1/4 cup or so of chicken stock just to get the liquid to almost cover the chicken mixture. Stir it all together and let it simmer with the lid on for about 30-40 minutes. Make sure it is simmering and not a rolling boil. Then remove the lid and allow some of the liquid to evaporate and the sauce to thicken slightly. The longer you cook, the thicker the "gravy" will be. I like mine on the creamier side. Once the chicken is very tender and the sauce is to your liking, check the seasoning and adjust the salt and pepper as needed. Serve warm with Naan bread, or even on top of rice! You can garnish with chopped cilantro if you want a hint of freshness. Enjoy! I have been named the "Brunch Queen" by my friends, family and clients, but with this reign comes a lot of pressure. I am constantly having to come up with new and innovative brunch dishes that will keep my guests excited. This dish all started with my love for dried Turkish Apricots. These apricots are the perfect amount of chewy and juicy and have a sweet but floral taste to them. Some of the classic Turkish desserts involve honey, rose essence, pistachios and spices so I decided to take these flavors and combine them into the perfect savory but sweet parfait. The good quality extra virgin olive oil I use in the granola just add this rich, savory element to the dish that is perfect with the sweet honey and apricots. In a large bowl, combine oats, pistachios, pumpkin seeds, coconut chips, maple syrup, olive oil, brown sugar, salt, cinnamon and cardamom. Spread mixture on a rimmed baking sheet in an even layer and bake for 45 minutes, stirring every 10 minutes, until golden brown and well toasted. Store in an airtight container or mason jars if you do not use all of it right away. Choose the parfait glasses or bowls you would like to assemble the parfaits in and set aside. In a medium bowl, whisk together the Greek yogurt with just 2-3 drops of Rose Extract. If you prefer a stronger rose flavor add more to your liking. Note that it is very strong and can be overpowering, you want the flavor to come through but subtly. Scoop a few tablespoons of the rose infused yogurt into each parfait cup. Drizzle the yogurt with clover honey, sprinkle it with a few pieces of the chopped apricots and the Pistachio Granola. Repeat the layers as many times as you like! Be sure to have the top layer include the granola, apricots and a nice drizzle of honey. Enjoy! 2 Heaping Tablespoons of Almond Butter ( My favorite is the Classic flavor from The Nutty Spoon https://thenuttyspoon.squarespace.com/) You can order online! Line a 9 by 9-inch baking dish with parchment paper and spray with nonstick cooking spray and set aside. (you can use a square dish too and have them a bit thicker) Preheat the oven to 350 degrees F.
Spread the oats and almonds onto a half-sheet pan. Place the flax seed on a separate sheet pan. Place pans in the oven and toast for about 15 minutes, stirring occasionally. Flax seeds may be faster depending on your oven so check on them frequently! You just want them lightly toasted and aromatic. In the meantime, combine the honey, brown sugar, coconut oil, vanilla extract and salt in a medium saucepan and place over medium heat. Cook until the brown sugar has completely dissolved. Stir in the Almond Butter just until it is melted and incorporated. Once the oat mixture is done, remove it from the oven and reduce the heat to 300 degrees F. Immediately add the oat mixture to the liquid mixture, add the dried fruit, and stir to combine. Turn mixture out into the prepared baking dish and press down, evenly distributing the mixture in the dish. Sprinkle the cocoa nibs over the top and and place a piece of parchment on top and press down to ensure the mixture doesn’t stick to your hands. Bake for 25 minutes. Remove from the oven and allow to cool completely (will take a few hours or so). Cut into squares (or whatever shape you like) and store in an airtight container for up to a week. The reason why I love living in New York City so much is because I can get the best food from any type of cuisine at any time. My sister recently introduced me to this fabulous Japanese restaurant in the West Village that is serving up some super authentic yet innovative dishes every evening. One of our favorite dishes that they serve is their Miso Black Cod. One night I decided to surprise my big sis and make my own version of this flavorful fish. The marinade is super simple and tastes good on pretty much any white flaky fish or even salmon. I even toss veggies in it and roast them until caramelized and tender. The salty, umami flavor or the miso paste (which is fermented soy beans), along with the sweet dark brown sugar and tangy Japanese cooking wine..hello heaven! Yea let me hear you say it "Oh Ive Got Room For More!" I use fresh Cod filets or even fresh Atlantic Salmon. Traditionally this is made with Cod. For this amount of marinade I buy 1 Lb of fish which will feed roughly 2 people. You can even toss your vegetables like broccoli or diced Japanese eggplant in this marinade and roast them until tender. This marinade brings so much flavor to just about any fish or veggie! Whisk together all the marinade ingredients in a bowl. Place your fish in a ziplock bag or in a container and baste the filets with about 2-3 tablespoons of the marinade. Set the rest of the sauce aside. Marinate the fish in the fridge for about 45 minutes, but no more than 1 hour. For the last 15 minutes remove the fish from the fridge, you don't want to start cooking it when it is ice cold. Preheat your oven to 375F. Heat up an oven proof skillet or grill pan with low sides on medium heat. Put a small drizzle of olive oil on the pan to prevent the fish from sticking. Gently place the fish onto the hot pan. Allow the fish to get slightly charred and caramelized on one side. Take the fish off the heat when you see the fish has caramelized on one side. Do not flip it it may fall apart if you are using cod. Baste the fish with as much of the remaining marinade as you can get on it. Then place the pan in the oven so the fish can cook through. It should only take about 5-6 minutes. Just make sure the fish is flaky and not cold or raw in the center. Sprinkle some toasted sesame seeds and scallions over the fish and serve with your favorite veggies, rice or whatever you'd like! I love to baste some eggplant in the same marinade and roast it until tender and golden. I also love to serve this with nice greens like sautéed garlic broccolini. I would like to think I am not like all the other 20 something year old years, except for my taste in television shows. I have to admit I love the show The Bachelor. The drama, the unrealistic dates, the sappy proposal speeches, you just can't not get hooked! Why am I bringing this up? Well my sister, my best friend and I have Bachelor Mondays where we each take turns hosting the group for dinner and of course The Bachelor viewing. For the shows big finale, my best friend Rebecca had one wish, and that was for me to recreate her favorite appetizer from one of the best restaurants in NYC. Lucky for her, her best friend (me) is a chef, so helloooo challenge accepted and dominated, but of course I had to put my own "Got Room For More" spin on it. I changed up the type of squash and added the beautiful nutty crunch of the toasted pumpkin seeds (pepitas). Well lets just say I totally got the rose that night...and so did Lauren B (who we were rooting for since day 1). You go girl! Now what to do until The Bachelorette starts..sigh. We cannot wait to cheer on JoJo the newly elected Bachelorette while we stuff our faces and cry about how we don't look as good in a bikini. Heat the oven to 450F. Combine the squash, 1/4 cup olive oil, chile flakes, honey and 2 teaspoons of salt in a bowl and toss well. Transfer the mixture to a parchment or foil-lined baking sheet and cook, stirring every 10 minutes, until tender and slightly colored, about 20-25 minutes or a little longer. You want the squash to be fork tender and slightly caramelized. Remove from the oven. Meanwhile, heat another 1/4 cup olive oil over medium heat, add the onions and remaining teaspoon salt and cook, stirring frequently, until the onions are very soft and darkening, at least 20 minutes.Add the vinegar and syrup, stir and reduce until syrupy and broken down, again at least 15-20 minutes or so. You want it to be a nice caramelized, cohesive mixture that has a jam like texture. Combine squash and onions in a bowl and smash with a fork until combined. Taste for seasoning. Spread the ricotta cheese on toasts, then top with the squash-onion mixture. Sprinkle with a small pinch of coarse salt, a little bit of the toasted pumpkin seeds and finally the fresh mint. I wait all year for squash blossoms to be in season..and finally they are here! There is just something so enchanting about cooking up these gorgeous, big, orange flowers and they taste freakin awesome! My family always grew squash in our garden each year, and when the plants began to flower, my grandma would pick the blossoms off the vines and would fry them in a simple tempura batter. As much as I absolutely adore fried squash blossoms, I decided to use them in a heartier and healthier dish that can be eaten for breakfast, brunch, lunch, or dinner! The presentation of this frittata alone will wow your family and friends. I actually sent a picture of it to my Dad and his response was "where are you right now? " He thought I was eating it at a NYC restaurant, but no it was in my very own home and it didn't take longer than 25 mins! Prepare the squash blossoms by removing the stems and outer green spiky leaves that are around the stem area. Then remove the stamen inside the flower. In an oven safe skillet or frittata pan, heat about 3 Tablespoons of Olive Oil on medium heat. Sweat the chopped onion, garlic sprouts (or minced garlic clove), and chopped zucchini until the onions and zucchini are soft in texture. Add the corn kernels and cook a few more minutes or until the corn is slightly cooked but still has a nice crisp bite to it. In a large bowl beat the eggs, cream, salt, pepper, Tarragon, Basil and Parsley. Now pour the egg mixture into the pan, and stir to evenly distribute the ingredients. Let the egg set about half way on low heat, occasionally using a rubber spatula to loosen the frittata from the sides of the pan. Now evenly lay your squash blossoms on top in a nice pattern. Crumble the goat cheese around the frittata evenly. Put it in the oven for 10-15 minutes and bake until full set in the center. Remove from the oven, sprinkle with more fresh Basil or other herbs, cut and enjoy! One of my favorite things about living in NYC is that you can find any cuisine from any part of the world, no matter how obscure. One of my top 5 favorite cuisines is Lebanese food. Of course the hummus, Babaganoush, lamb dishes and Tabbouleh are second to none, but one of my favorite Lebanese restaurants in town, has the best brussel sprouts you will ever taste. So good that I did everything in my power to figure out the recipe. After a few trial runs I came pretty darn close to the recipe! These are perfect for your next dinner party or holiday celebration! They are nutty and sweet and umami and they take you on a flavor journey. 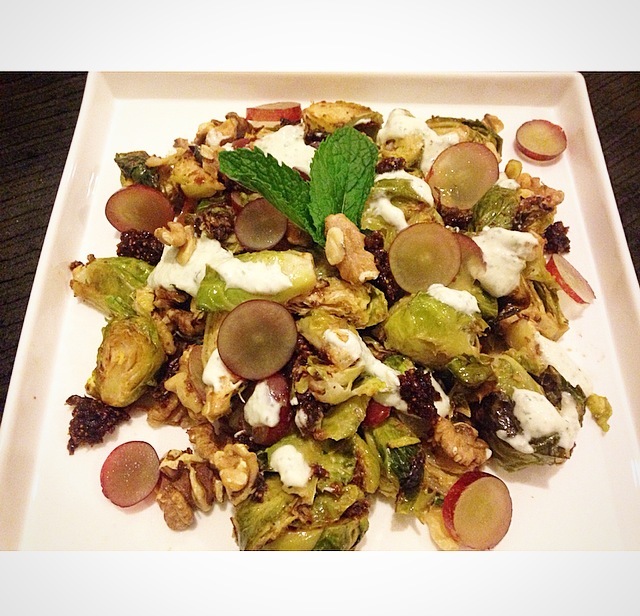 This dish consists of Brussel Sprouts, a mint yogurt sauce, fig jam, toasted walnuts and sliced red grapes. With each bite and each breath you will be introduced to new flavors and textures. A great recipe isn't one dimensional, it makes you experience and array of different flavors as you are eating it. This gorgeous dish is sure to impress! Prepare the Fig Jam by placing the dried figs, the water, sugar and vinegar in a small pot. Bring the mixture to a simmer and cook the figs until they rehydrate and almost all of the liquid is evaporated and whatever is left is syrup like. Allow to cool for a few minutes and then place in a food processor or blender until smooth and jam like. Set aside to cool. Prepare the Yogurt Sauce by blending the Greek yogurt, lemon juice, Fresh Mint, Garlic, Tahini, and a dash of Salt and Pepper. Wash and dry the Brussel Sprouts and cut the tough core off the bottom. Slice each sprout in half or in quarters if they are really big. You just want them bite size. Lay them on a sheet pan lined with aluminum foil and drizzle them with olive oil , the 2 Tablespoons of Sherry Vinegar and salt and pepper. Roast them in the oven until they are golden brown and crispy on the edges and tender inside. Place the Brussel Sprouts in a bowl and toss them in a few spoonfuls of the yogurt sauce and a few spoonfuls of the fig jam, and the toasted walnuts. You do not want them saturated in it, you just want them to pick up some of the flavor. Plate them on on a nice serving dish and sprinkle some more of the nuts nicely on top along with a nice sprinkle of the sliced grapes. Using a spoon drizzle some more of the yogurt sauce on top and then dot some more of the fig jam on top. Garnish with more fresh mint if you'd like. Spring is coming! We have moved from 15 degree temperatures to 50 degrees within one weeks time and it feels oh so good. Spring to me means fresh veggies and salads, or anything light and fresh. Over the course of a few years, Brussel Sprouts have become HUGE! They are one of the most popular items on restaurant menus and one of the easiest vegetables to pick up at the grocery store. I turned an American favorite, Coleslaw, into a unique slaw equipped with crunchy, shredded brussel sprouts, crisp granny smith apple and bright, green onion and celery seed. Serve this one beside sandwiches at a luncheon or BBQ or with any dinner entree. Enjoy! 1/2 Granny Smith Apple Peeled and Shredded (I use the julienne setting on my mandolin slicer or you can do it by hand or on the large hole of a cheese grater. Whisk together the mayo dijon, vinegar, sugar, celery seed and salt and pepper. In a separate bowl toss together the Brussel Sprouts, Apple, Scallions and Parsley. Pour the dressing over the sprout mixture little by little until it is dressed to your liking. You can eat it right away but it is best to wrap it up and put in in the fridge for a few hours or overnight so the flavors really come together. Nothing is better than a hot bowl of Pasta "Fazool" on a cold winter day! Everyone knows February is award show month, and this is my "Award Show Meal." I like to make a big pot of this and then cuddle up in sweats on the couch with my boyfriend and friends in front of the television. We sit and watch all of our favorite celebrities in awe, commenting on their wacky outfits and their butchered acceptance speeches...and the good ones too. Heat a large ceramic pot (like a Le Creuset if you have it) on medium-low heat. Add the bacon and cook until the fat renders, about 10 minutes. Remove the bacon and set aside (you will add it back in). Add the onion, carrot, celery, red pepper flakes and bay leaves and increase the heat to medium; cook, stirring frequently, until the onions become translucent, about 5 minutes. Add the garlic and cook 1 minute more, stirring constantly so the garlic doesn't stick to the bottom of the pan and burn. Add the wine and cook until it has reduced slightly. Add the bacon back to the pot along with the broth, beans, lentils, chickpeas, diced tomatoes and rosemary. Increase the heat to high and bring to a boil, then reduce the heat to medium-low and simmer, uncovered, until the lentils are just tender, 15-30 minutes. Season with salt and pepper as needed. Use a slotted spoon to transfer 1 cup of the bean mixture and a little liquid to a blender or food processor. Hold a kitchen towel over the opening to prevent splatters as the liquid is very hot. Purée until smooth and add back into the pot. This will help to thicken the soup slightly. Add the dried pasta to the pot and stir to incorporate. Turn the heat up to a gentle boil and cook until the pasta is tender but still firm to the bite, anywhere from 8-12 minutes depending on the type of pasta you used. The soup will thicken a bit by the time the pasta is cooked. Discard the bay leaves. Ladle the soup into bowls. 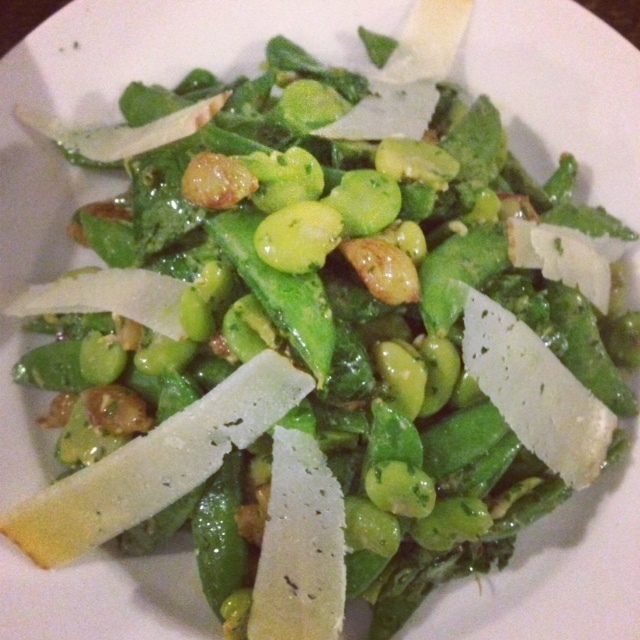 Drizzle each portion with a touch of extra-virgin olive oil and grate a good amount of Parmegiano Reggiano on top. I am a woman with a very demanding full time job and a big appetite. I love a good home cooked meal as much as the rest of you, but we all know that time is of the essence during the work week. Stressful business meetings, long commutes, squeezing in time at the gym and keeping up with emails seems to be the weekly routine for most of us living in Metropolitan cities, but I can show you how you can prep one simple ingredient at the beginning of the week, maybe Sunday evening, and have several completely different tasting meals all week long. 1 Large Butternut Squash (peeled, seeds scooped out and cut into 1 inch cubes) I like to but the pre-cut squash in the produce fridge to save some time! In a roasting pan toss together the squash, sage, salt and pepper to taste and the shallots. Drizzle on Olive Oil just to coat each piece of squash with a thin layer of oil. Roast in the oven for roughly 25-35 minutes tossing them mid way through the cooking process for more even cooking. They are done when they are slightly golden brown on the outside and soft on the inside. You want to be able to prick them with a fork easily. I like to eat the squash in a kale salad with a simple vinaigrette, dried cranberries or cherries, and chopped almonds or walnuts. You can also eat it as a side with any protein you like! Blend the Roasted Squash in a blender until creamy. Add a heaping dollop or two of the Greek Yogurt and some Chicken Stock until you reach your desired texture. If you like you soup thick put less stock, if you like it a little thinner keep adding stock a little at a time. Season with salt and pepper to taste. Heat up in a pot or in the microwave and serve! Also good with toasted shelled pumpkin seeds as a garnish. 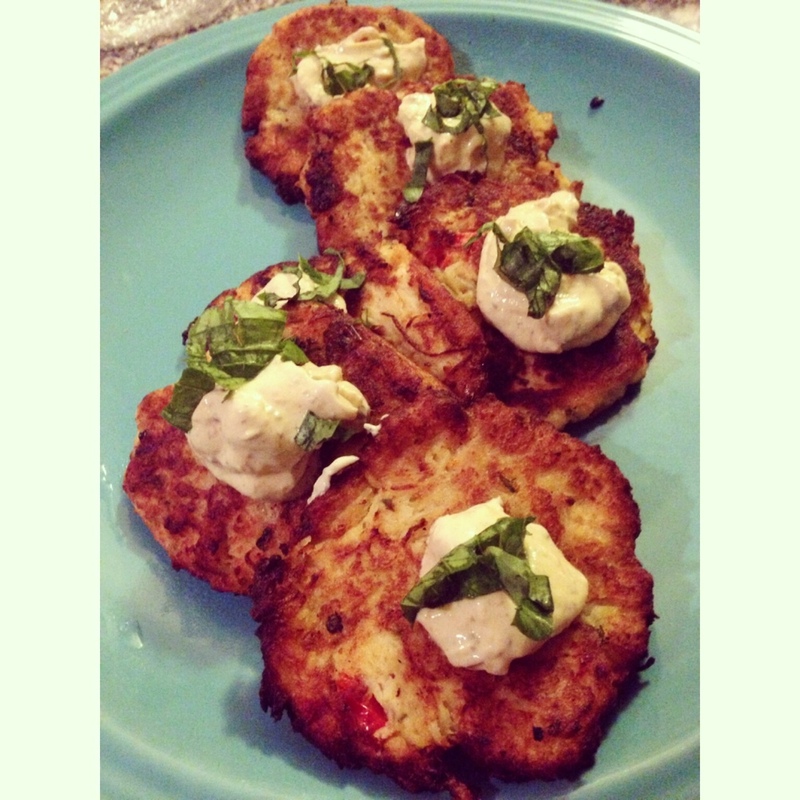 Spaghetti Squash Fritters- Vegetarian "Crab Cakes"
I HATED leftovers as a child! I always felt like they never tasted fresh, and being the foodie that I am, I didn't want to have the same dish multiple times in one week. Once I started managing restaurants and cooking in professional kitchens, I realized how important it is to take the scraps and leftovers of your vegetables, meats, cheeses etc. and use them to create more dishes! Ultimately, if you throw good, useable leftovers in the garbage, you are throwing money in the garbage! This week I had a substantial amount of Spaghetti Squash leftover, so I got a little creative and created a delicious appetizer to bring to my friend's apartment for dinner. These fritters are crispy on the outside and soft and flavorful on the inside. The pleasantly stringy texture of the spaghetti squash and the flavors of the capers, sun dried tomatoes and breadcrumbs oddly make these little patties taste just like crab cakes! My friends kept insisting that I was lying to them and that they were crab cakes and not vegetable fritters! So if you are a vegetarian or have vegetarian guests, this is the perfect dish to serve! You can even make a "crab cake" sandwich by making a larger spaghetti squash patty, put it on a nice brioche bun with a cajun style aioli and top it with some mixed greens..now how delicious does that sound! Preheat the oven to 400F. Cut the spaghetti squash in half vertically using a big chefs knife. Scoop out and discard the seeds from the middle of the squash and then drizzle the flesh with olive oil and salt and pepper. Place the cut side down onto a foil or parchment line sheet pan and roast in the oven about 35-45 minutes or until a fork can easily poke through the outer skin of the spaghetti squash. When the squash is cooked, using a fork scrape the squash flesh into a bowl. It should fall into the bowl like spaghetti! Let it cool and set aside. Once the spaghetti squash is cooled place in some paper towels or a clean kitchen towel and try to squeeze out any excess water that the squash naturally has. Place the squash in a bowl and add the minced garlic, chopped sun dried tomatoes, parmesan cheese an capers. Add the 2 beaten eggs and a dash of salt and black pepper. Stir together until combined. Add the seasoned breadcrumbs, about 1 Cup and stir together. Add about 2 Tablespoons of Flour and stir together. This will help to bind the mixture. If you try to fry them and they are not crisping up and are just falling apart, add a little more breadcrumbs and flour. Coat the bottom of a skillet with Canola Oil and heat on medium heat. Test the temperature of the oil by placing a dot of the batter into the oil and if the oil sizzles around the batter, your mixture is ready. Scoop about 1 1/2 Tablespoons of the mixture into you hands, make a ball, and flatten it out into a pancake shape. You want them about 1/3 inch thick. Place them in the pan with the hot oil and fry until golden brown and crusty on the bottom and then flip and brown the other side. Only fry a few at a time so they brown evenly and the oil temperature doesn't drop. When they are cooked place them on paper towels to drain the excess oil. Serve with a dollop of the Sun Dried Tomato Pesto Crema! See below! 1. Mix together some Sun Dried Tomato Pesto with the Greek Yogurt, a drizzle of Olive Oil and the chopped Basil. Add a pinch of salt and a dash of pepper, and give it a taste! If you feel the flavor or color is too bland add more of the pesto! That is all there is too it! Green eggs is no longer just a phrase in a famous children’s book, it is now another delicious recipe in your repertoire. I just love a good egg salad, but it is full of mayonnaise which is fattening and high in calories. I had a craving for nice, creamy egg salad, but had just returned from the gym, so I came up with a dressing that is just as creamy as the mayo but is much healthier! A nice, ripe avocado does just the trick! When pureed with the vinegar, olive oil, lemon juice and other flavor components, the avocado turns into this mixture that is as smooth as silk and a beautiful sage green color. Enjoy it on a bed of lettuce, with sliced tomato or on your favorite bread! Remove the pit and skin from the avocado and scoop the flesh out into a food processor or blender. Add the lemon juice, salt and pepper, Dijon, honey, vinegar, and olive oil. Blend until the mixture is silky and smooth. Add water a few tablespoons at a time until it has reached your desired texture. You want it to loosen up slightly so the eggs can be mixed in easily but do not make the mixture watery. Chop up the hard-boiled eggs. Toss the eggs with the red onion. Toss the egg mixture with the Avocado Dressing. Sprinkle with a little salt and pepper and fresh chopped chives or dill. Eat on top of sliced tomato, mixed greens or on your favorite bread!